Shalom and Merry Christmas! These two pieces have a lovely synchronicity, in shape, colour and form. The funky symbol of Shalom- Hebrew for peace- has a handwritten message on its timber back – ‘Jerusalem’ which I take to be its place of manufacture. The deep blue and orange of the ceramic tile are so very 60s. The tile is framed and has a hook for hanging on its back- this Shalom is meant for display. Meanwhile Richard Burton- THE Richard Burton -has written a story about his [impoverished] Welsh childhood and subsequent Christmases. He also provided the illustrations. Apparently an acTOR and an author/illustrator. It’s a bit of a turgid read, but this book was continually republished until the late 80s. Must have been doing something right. I bought it mainly for the lovely graphics on the hardback cover. Wishing all my readers Shalom, and Merry Christmas! And I am sure Richard Burton would want to add his wishes also. Shalom! and – Merry Christmas! 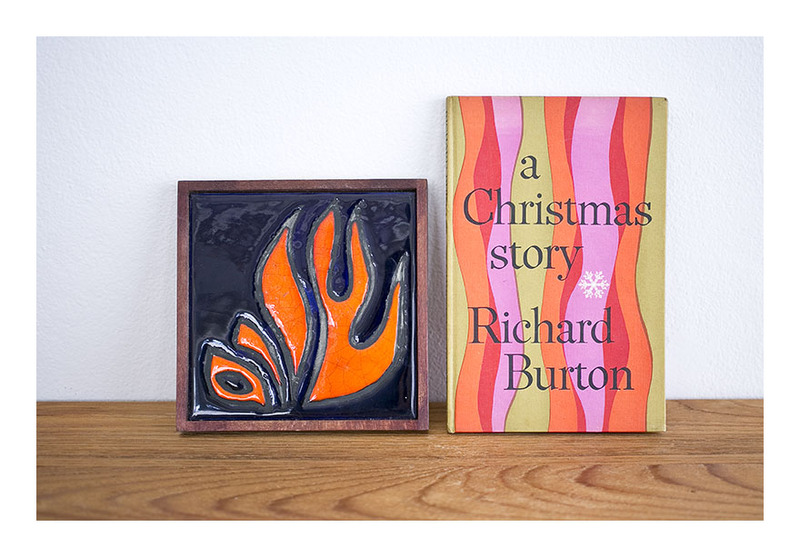 Meanwhile Richard Burton- THE Richard Burton -has written a story about his [impoverished] Welsh childhood and Christmases. He also provided the illustrations. It’s a bit of a turgid read, but this book was continually republished until the late 80s. Must have been doing something right. I bought it mainly for the lovely graphics on the hardback cover.